What are some of your favorite comfort foods? When I asked The Baron this question not too long ago, he mentioned that he really enjoyed chicken pot pies. It's been awhile since I've made a gluten free pie, much less a savory one, so this was a great opportunity to play with a gluten free pie dough. 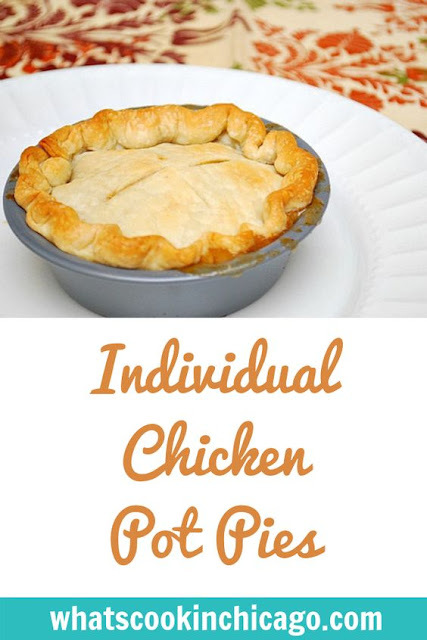 Rather than a larger pie, I made these Individual Chicken Pot Pies for dinner recently. The buttery, flaky crust went perfectly with the savory vegetable filling. If you're looking for some comfort on a cold winter day, this will definitely hit the spot! The gluten free crust for this came out nice and flaky... I can only imagine how great it comes out using regular all purpose flour. This is a great dish to make in advance, especially on those winter days you may be snowed in. They freeze beautifully too, making it a nice meal to make when you just want to pop something in the oven for dinner after a long day at work. In the bowl of a food processor pulse together flour, salt, sugar, and thyme. Add cubed butter and shortening. Pulse until mixture looks like coarse crumbs. Add cold water down the chute beginning with about half the water, and keep pulsing. Add more as needed and stop as soon as dough forms a very ragged ball. Do not add more water. Turn dough onto plastic wrap and remove blade carefully. Knead slightly to bring all the dough together. Wrap and chill dough for at least an hour. If making one large pie, roll dough between sheets of plastic wrap just slightly bigger than the pan. If making smaller individual pies or ramekins, roll dough in pieces just larger than the circumference of each pie or ramekin. Chill dough while preparing filling. For the Filling - Heat olive oil in a saute pan. Set aside diced chicken. Add carrots, celery, green beans, garlic, shallot, salt, pepper, and thyme to the heated oil. Saute until vegetables are just wilted and beginning to caramelize. Deglaze pan with 1/2 cup white wine, letting the wine almost evaporate. Add hot chicken broth and stir to combine, letting the broth reduce on a medium for about 5 minutes. Add flour to the other 1/4 cup of white wine and whisk to combine. Add to hot broth mixture and stir until it begins to boil and thicken. Remove from heat and stir in diced chicken. 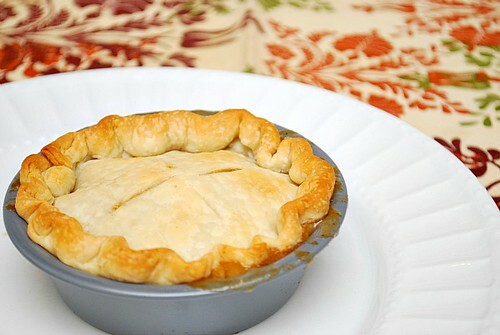 Place equal portions of the mixture in pie dish or individual pie or ramekin dishes. Set on a baking sheet. Preheat oven to 375. When oven is preheated, remove rolled dough from refrigerator. Top the pie or individual pie or ramekins with dough circles. You might have a little bit of pie dough leftover. Save it for another use. Pinch edges to seal and cut slits on top to vent. Sprinkle lightly with sea salt. Bake about 35-40 minutes or until the crust is golden brown and filling is bubbling through the vents. Cool slightly for about 10-15 minutes and serve. Delicious! I can't wait to try this!